Impact of European Settlement on the Indigenous People of Australia. 1 Impact of European Settlement on the Indigenous People of Australia. 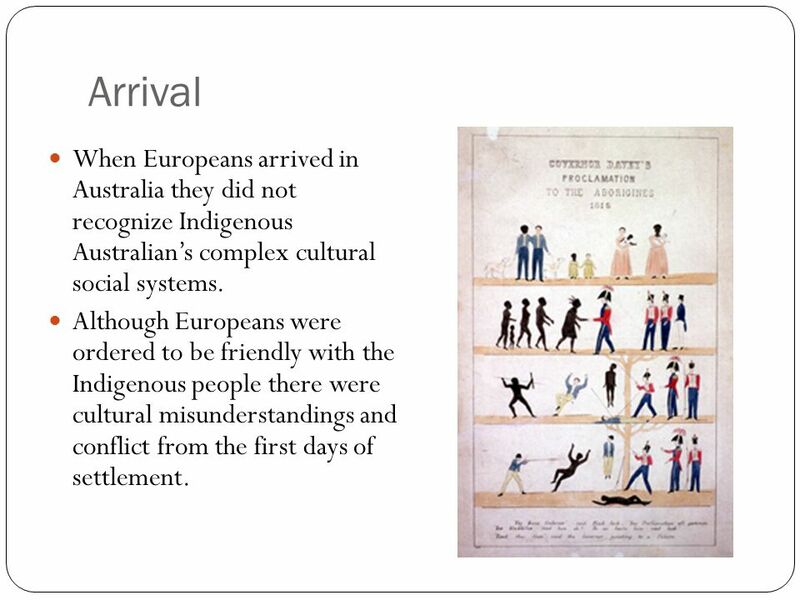 2 Arrival When Europeans arrived in Australia they did not recognize Indigenous Australian’s complex cultural social systems. Although Europeans were ordered to be friendly with the Indigenous people there were cultural misunderstandings and conflict from the first days of settlement. 3 Disease The Europeans introduced many foreign diseases that had a devastating impact on the indigenous population. One such disease was smallpox – a highly infectious and contagious illness. It creates headaches, fever and a rash would cover a person’s hands and feet. This often meant people could not walk or feed themselves. 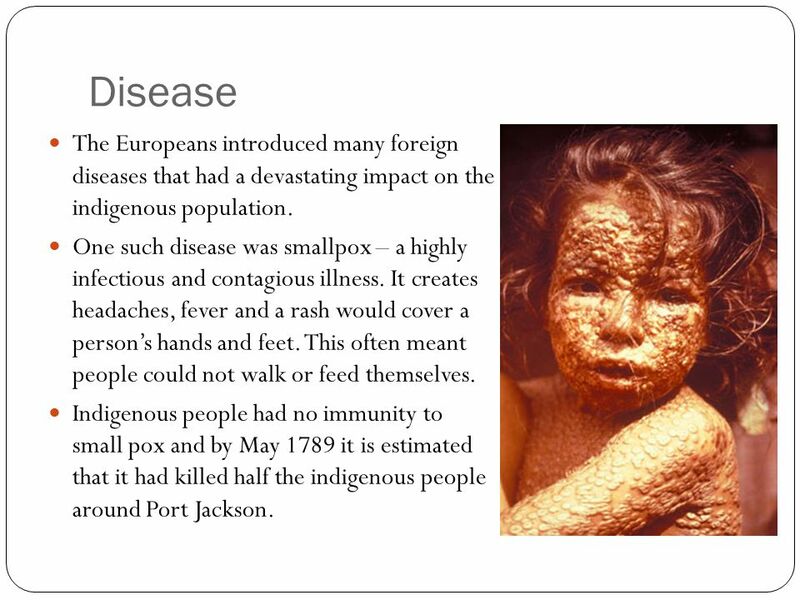 Indigenous people had no immunity to small pox and by May 1789 it is estimated that it had killed half the indigenous people around Port Jackson. 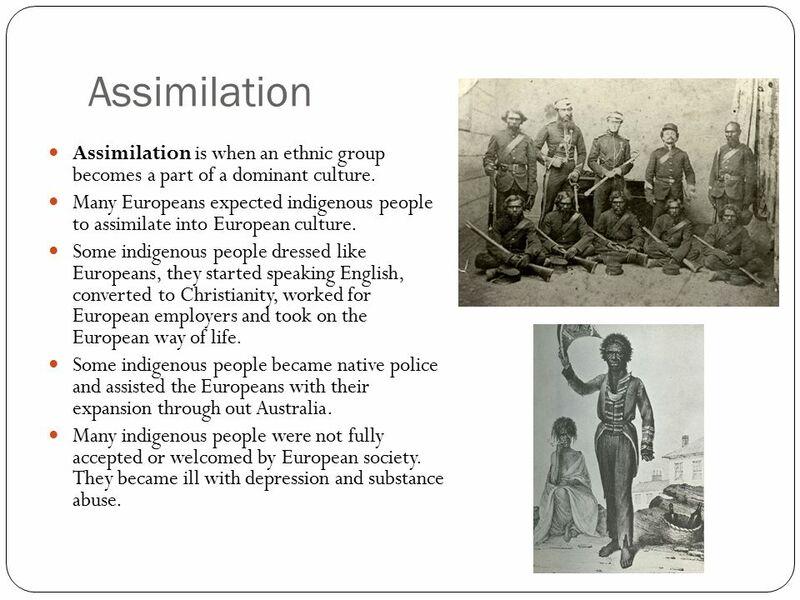 4 Assimilation Assimilation is when an ethnic group becomes a part of a dominant culture. Many Europeans expected indigenous people to assimilate into European culture. Some indigenous people dressed like Europeans, they started speaking English, converted to Christianity, worked for European employers and took on the European way of life. Some indigenous people became native police and assisted the Europeans with their expansion through out Australia. Many indigenous people were not fully accepted or welcomed by European society. They became ill with depression and substance abuse. 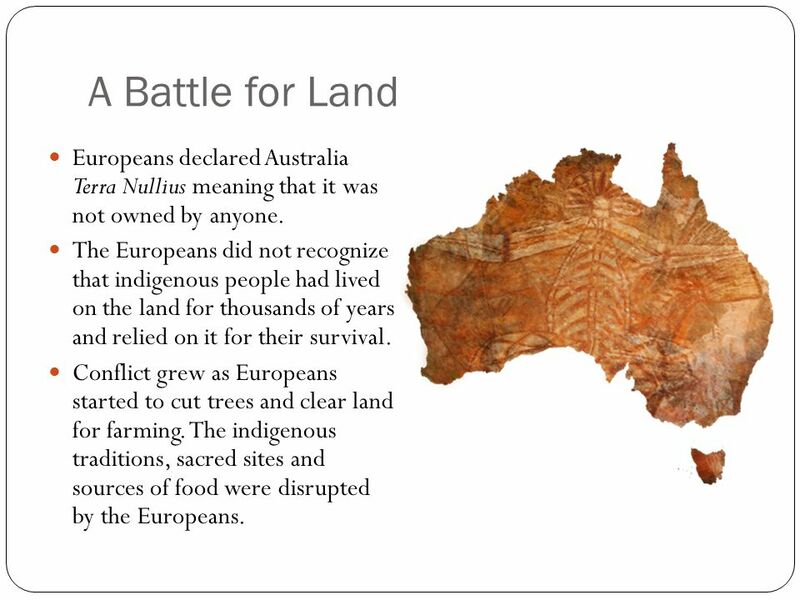 5 A Battle for Land Europeans declared Australia Terra Nullius meaning that it was not owned by anyone. The Europeans did not recognize that indigenous people had lived on the land for thousands of years and relied on it for their survival. Conflict grew as Europeans started to cut trees and clear land for farming. The indigenous traditions, sacred sites and sources of food were disrupted by the Europeans. 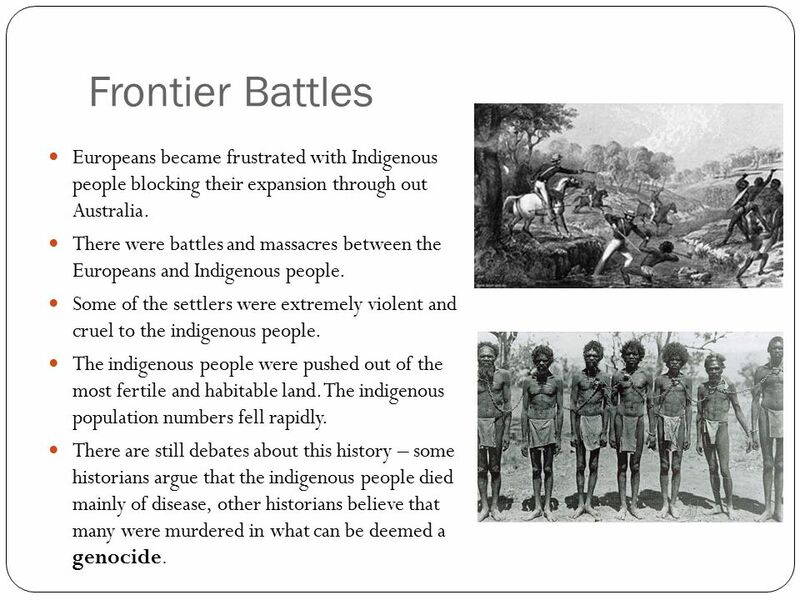 6 Frontier Battles Europeans became frustrated with Indigenous people blocking their expansion through out Australia. There were battles and massacres between the Europeans and Indigenous people. Some of the settlers were extremely violent and cruel to the indigenous people. The indigenous people were pushed out of the most fertile and habitable land. The indigenous population numbers fell rapidly. There are still debates about this history – some historians argue that the indigenous people died mainly of disease, other historians believe that many were murdered in what can be deemed a genocide. 7 Genocide Genocide is a term used to describe the deliberate and systematic destruction of a culture, ethnic or political group. 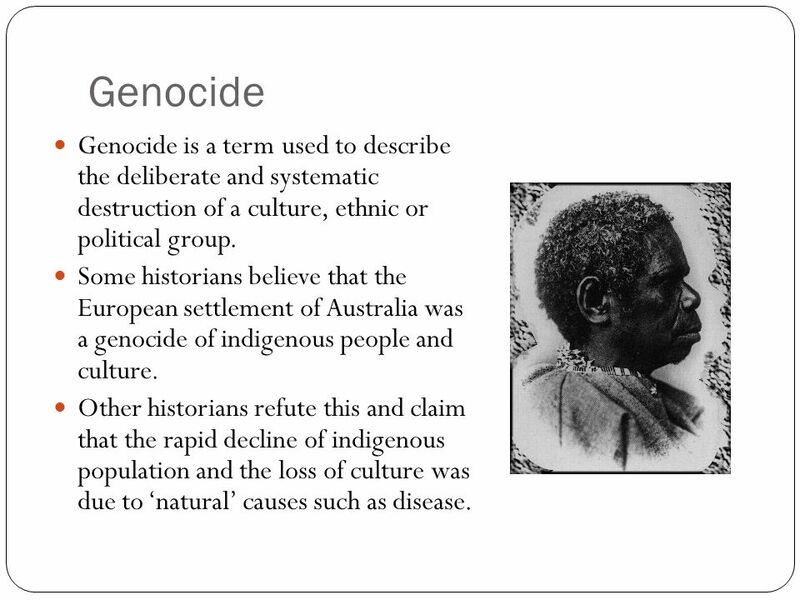 Some historians believe that the European settlement of Australia was a genocide of indigenous people and culture. Other historians refute this and claim that the rapid decline of indigenous population and the loss of culture was due to ‘natural’ causes such as disease. Traditionally the European arrival has been referred to as the “Australian settlement”. In recent years historians have started to consider the devastating impact that European arrival had on indigenous life. The arrival has began to be seen as an “invasion”. The 26th of January marks the anniversary of European arrival in Australia. It is known as Australia Day. 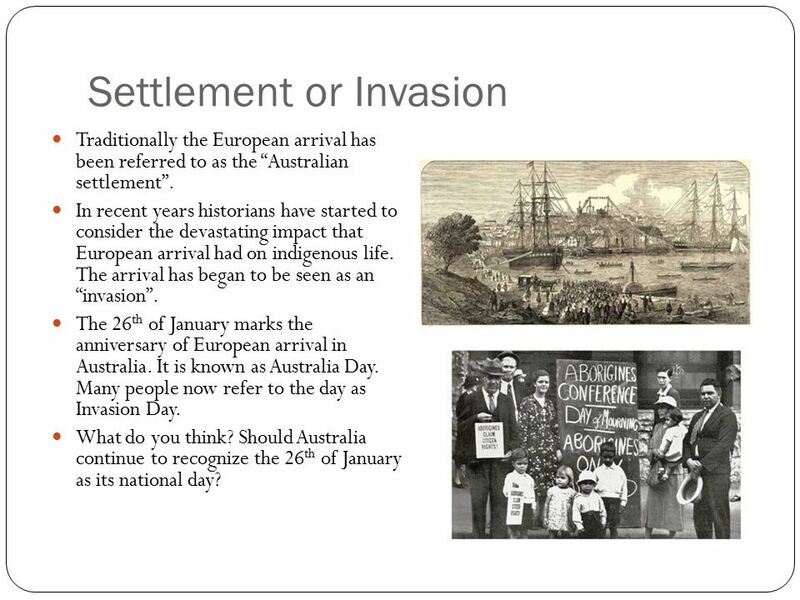 Many people now refer to the day as Invasion Day. What do you think? 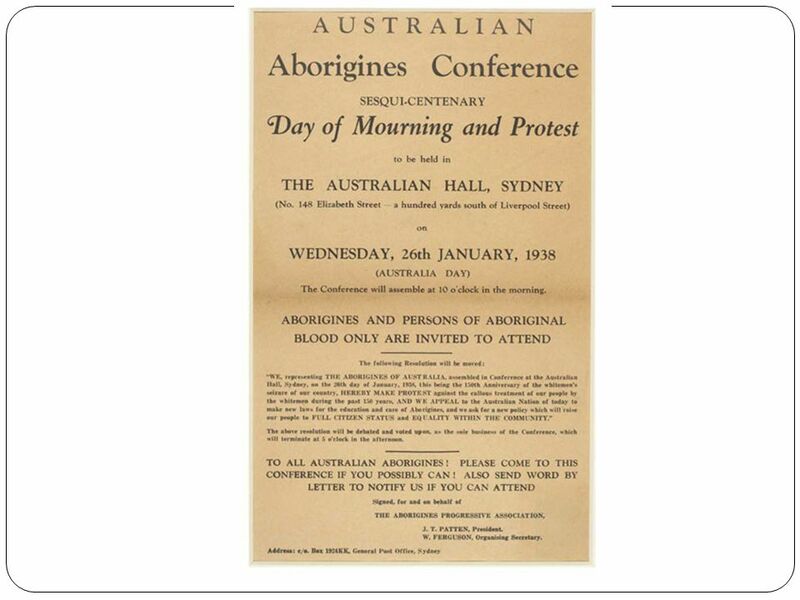 Should Australia continue to recognize the 26th of January as its national day? 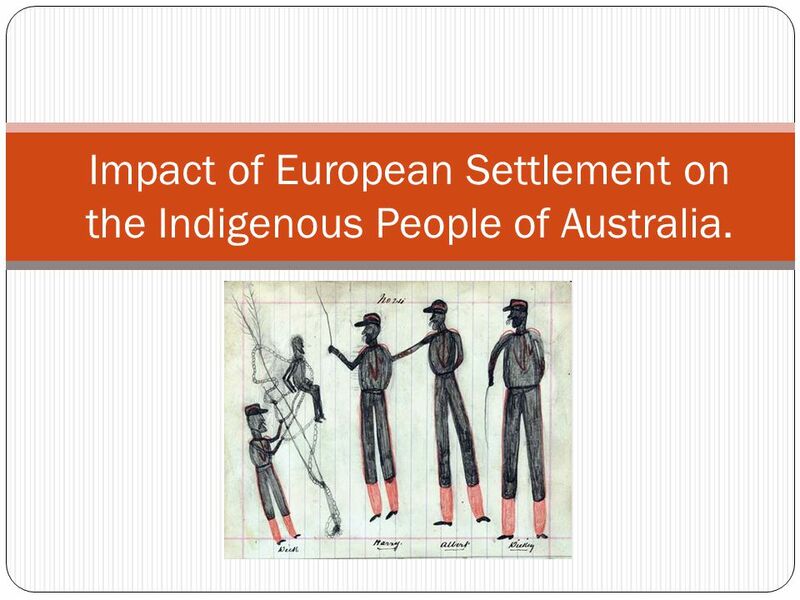 Download ppt "Impact of European Settlement on the Indigenous People of Australia." RELATIONSHIP WITH THE LAND AS INFLUENCED BY EARLY EUROPEANS Unit 3 - Outdoor & Environmental Studies. Age of Empires In the 15 th century European nations had begun to expand on their horizons and explore beyond the European and Mediterranean World. This. Objectives Identify the destinations of settlers heading west in the early 1800s. Describe the unique culture of the Southwest. Explain the meaning of. Cultures Clash on the Prairie Western business boomed out west while the culture of the Plains natives declined. Latin America SS6H1 (B) Explain the impact of the Columbian Exchange on Latin America & Europe in terms of : the decline of the indigenous people, agricultural. THE TRAIL OF TEARS Westward Expansion, at the expense of the innocent. Chapter 25 Section 1 The Cold War Begins Section 2 Westward Expansion and the American Indians Compare the ways Native Americans and white settlers viewed. TEKS 8C: Calculate percent composition and empirical and molecular formulas. Canada, Australia, and New Zealand. The “Vanishing” Indian. Manifest Destiny The frontier had been closed with Euro-American expansion into every area of the country- Many white settlers. Impact of European colonization on Indigenous people in Australia. Noor Al thani 8B. Colonization & Imperialism. Why Europe? Europe is also known as the “peninsula of peninsulas” which gives the continent excellent access to the sea. This.